Jane's Countryside is the latest release from Artistic Outpost. 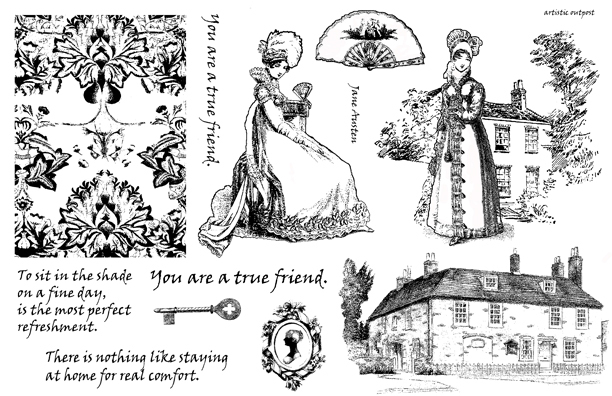 This collection pays homage to Jane Austen, and features Edwardian ladies dressed in their finery, original quotes from Jane herself, and a regal manor that could have served as the Austen family home. Coordinating elements include a cameo, key, and a lacey ATC sized background. Stamps are available in mounted and unmounted. I love this image of Jane standing in front of the house. I stamped the image in Black Archival on Watercolor paper, then colored using the Marker Watercoloring Technique. 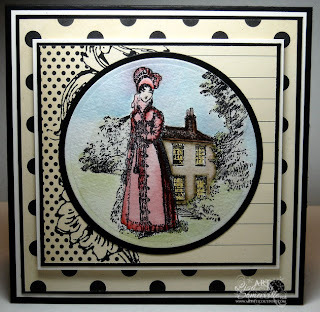 The stamped panel was cut with Spellbinders Circle Dies, then layered on a Black Circle. I thought Stampin' Up! 's Love Letter DSP was perfect for this image of Jane. Don't forget, for a limited time you can save 10% on all rubber stamps at Artistic Outpost, and you'll earn a $10 Gift Code for each $50 you spend! See more details here! Wow, love how you framed with this pt and the image is so beautiful, and your coloring is fabulous. What a beautiful card. What a beautiful Vintage scene! Great job coloring the image Lisa! WOWZA this card is beutiful, love the vintage look, beautiful work!! Just the right amount of color. Stunning! Love this design. :) (Circles and Squares) Beautiful paper and coloring! So pretty! Your coloring is so soft and beautiful. Jane is just so elegant in the setting you provided for her! Amazing layout, beautiful card. Gorgeous marker painting ... love the DP too. 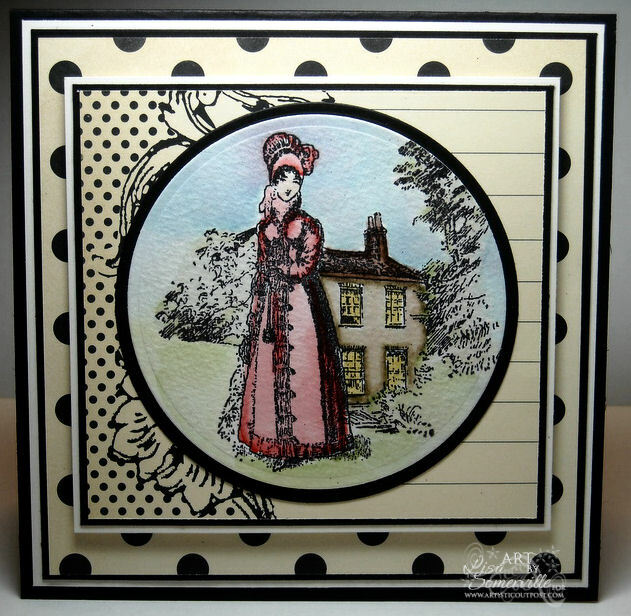 beautiful classic card with the lovely shapes and layering. I love it. I love that lace background, very pretty! beautiful layers and Love the softness in your coloring! Beautiful scene. I love how you used the soft colors behind to bring out the main image. The DP is striking with the image. Gorgeous job. so soft and pretty and i love all of the layering on this card! Lisa, this is so regal! I love the background designs you used. The squares and the circles, and the big dots and the small dots. The watercoloring is beautiful, too. I really love this piece! I don't think I wished you a blessed Thanksgiving. I pray that you have a wonderful day of Thanksgiving! Beautiful card Lisa! This most elegant lady just stands out so nicely with the subtle colored background. Oooooooo quite STUNNING! Love it!